It wasn't so long ago that electric mowers offered many pros balanced against one big con—subpar cutting performance. 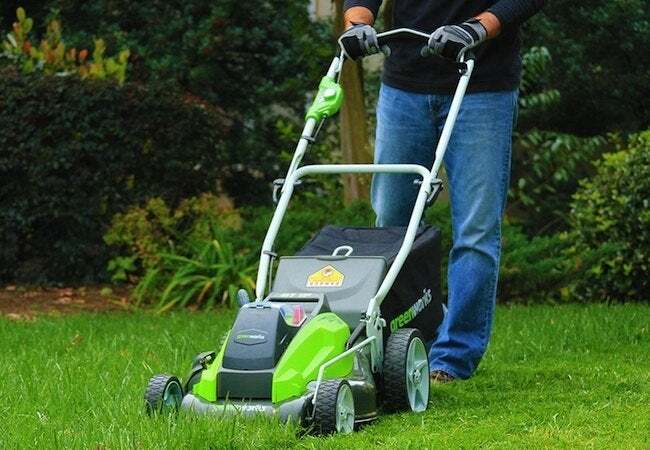 Today, however, there's reason to believe the era of easy, even enjoyable lawn care has finally arrived, and not a moment too soon. Even as a kid, when my five-dollar allowance depended on it, I hated mowing the lawn. Decades later, things have changed—for instance, nobody pays me to do chores anymore. But I dread the start of mowing season as much as ever, if not more so, because my house sits a large, corner lot, with grass that grows quickly enough to require twice-weekly trimming some months. Plus, even though I’ve lived through a series of cataclysmic technological breakthroughs in recent times—the advent of cellular phones, for instance, or the world-beating dominance of digital computing—the average 21st-century gas mower seems strikingly similar to the heavy, noisy, cumbersome and upkeep-intensive model my parents used to own. That’s not to say there’s been no innovation—far from it! In fact, years ago, in direct response to homeowner frustrations with conventional gas models, forward-looking manufacturers began rolling out lighter, quieter, lower-maintenance and cleaner-running electric mowers. Today, with electric mower technology having fully matured—and with corded models having cleared a path for battery-powered ones—the best of the new breed succeed in performing on par with their gas-guzzling cousins, even while tempting homeowners with a raft of user-friendly incentives you can’t get with a traditional model. Need proof that mowing isn’t what it used to be? Check out the Greenworks G-MAX 40V 19-Inch Cordless Mower. If you’ve only ever cut your lawn with a traditional mower, prepare yourself for a very different kind of experience. The first thing you notice about the Greenworks G-MAX? For me, it wasn’t the light weight or compact design of the equipment, but rather the total absence of gasoline—and all the little ancillary concerns that go along with maintaining a machine more like a car than a yard tool. So instead of making the first of many trips down to the local gas station—a costly proposition—and instead of having to clear space in the already chockablock garage for the safe storage of extra gasoline—you can proceed directly to mowing, a task made considerably more pleasant by there not being any foul, unhealthy fumes in your face. 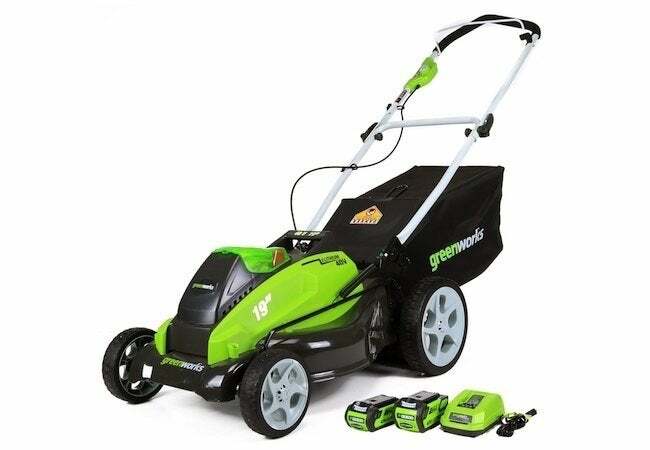 Another welcome feature you notice right away: Whereas step one in operating a gas mower entails the almost Herculean effort of pulling—pulling and pulling—the starter cord, the Greenworks G-MAX starts in seconds, requiring nothing more than the push of a button. Certainly, it’s nice not to feel exhausted even before you begin mowing. But for me, someone accustomed to the roaring engines of gas mowers, G-MAX impresses most of all because, for all of its effectiveness, the unit emits only a busy humming sound. In the past, I often delayed mowing until the late afternoon, at which point I figured the neighbors wouldn’t mind. Now, with a quiet-running electric mower, I can take care of the lawn whenever I want, guilt-free. The Greenworks G-MAX stands apart, too, because it’s almost effortless to control. In large part, that’s because it weighs 35% less than comparable gas models. What’s more: Greenworks G-MAX isn’t prone to the jitters and vibrations you get with other types of mowers. Instead, it coasts smoothly over the lawn, all while employing Smart Cut Technology to adjust power based on the thickness of the grass. You set the blades to your choice of seven cutting heights (ranging from 1-1/4″ to 3-1/2″)—and you select whether to mulch, side-discharge, or rear-bag the clippings (a handy 3-in-1 feature)—and the G-MAX does the rest. Finished for the day? You’ll like this: The handle folds all the way down to allow for hassle-free storage. Note that the Greenworks G-MAX 40V 19-Inch Cordless Mower package comes equipped with a battery charger and not one, but two batteries. If the LED indicator on the in-use battery lets you know it’s running out of juice—no problem. Simply swap in the replacement, and you’re back in business. 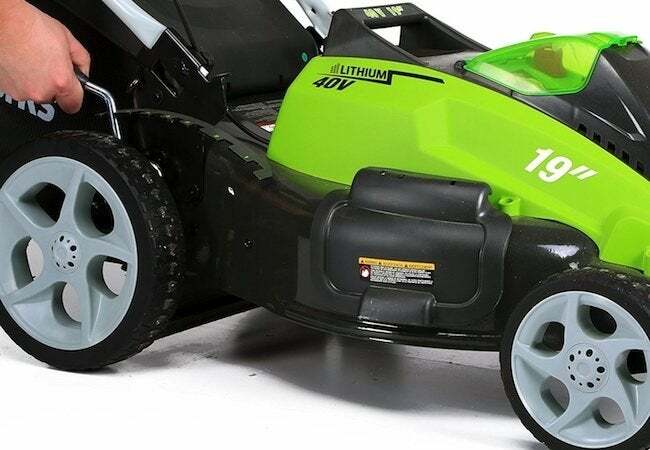 That said, depending on the size of your property, you may not even need the backup battery, since a fully charged 4Ah battery provides up to 45 minutes of continuous mowing over a whopping 6,500 square feet. Finally, and perhaps best of all, Greenworks gives you the freedom to use G-MAX lithium ion batteries across the full G-MAX line, which includes everything you need to keep your landscape lush and lovely. 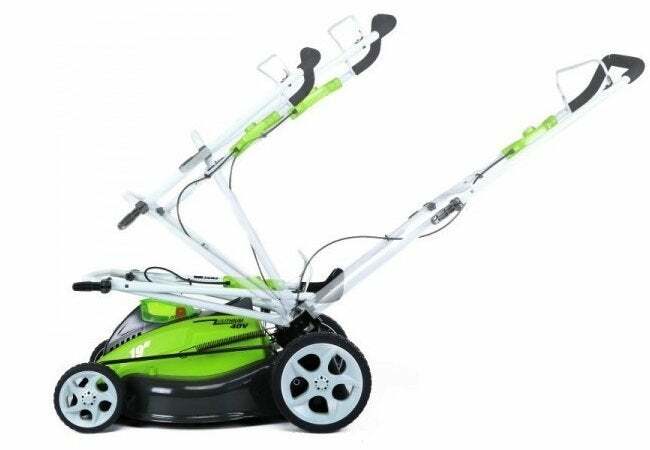 Purchase GreenWorks G-MAX 40V 19-Inch Cordless Mower, $279. This is a sponsored conversation written by me on behalf of Greenworks. The opinions and text are all mine.